What did my Tahiti luxury candle smell like? I’m starting to understand why Tocca is such a popular luxury brand. This is my third review of this company and I am completely mesmerized by their fragrances. Tahiti sounded beautiful and exotic and the moment I smelled it, I was captivated. The scent although floral was really elegant and lovely… I couldn’t believe how much I liked it. It was feminine, exotic, sweet and fresh all at the same time. How is that possible? A little side note, before I even started writing this review, I had this little candle sitting on my coffee table (still in the closed box) and the fragrance from the candle kept drifting all around me, teasing my senses. The aroma was a sweet floral scent so it threw me till I realized where the scent was coming from – a tiny little candle sitting a few feet away from me. What a beautiful description. I lit this candle in my powder room and within 20 minutes, the sweet fragrance of Tahiti was saturating the room and was even spilling outside into the hallway so the strength was phenomenal. The aroma…so beautiful. I must say, I am completely in love with this scent. It has to be the Tiare Flower which I’m going to keep my eyes peeled for in the future. I am not a fan of floral scents but this one had me completely mesmerized. The aroma in my bathroom was soft and exotic, lovely and sensual, soothing and tranquil all at the same time and blended with sweet coconut…. PERFECT! Every time I was near that room this candle was burning in, I was drawn to the aroma and found myself taking deep breathes in pure appreciation. Strength – on a scale of 1 to 10, I would rate this little candle an 8 in a small room. I wouldn’t go any bigger for this size candle. My candle burned perfect. No issues. I just had to keep the wick trimmed before each lighting. 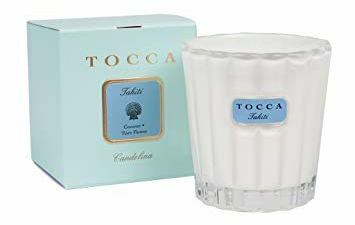 Tahiti so far is my favorite fragrance from Tocca and I am without a doubt purchasing this candle again but in a bigger size next time. 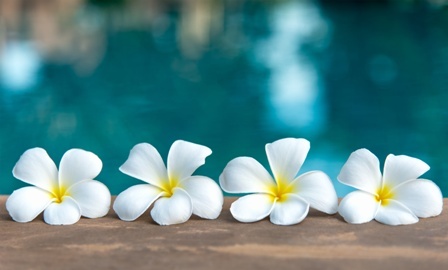 The Tiare Flower was really beautiful and blended with sweet coconut… oh my goodness – WOW is all I have to say!! I loved every second of it. Highly recommend this candle to everyone. Even if you don’t like floral scents. It was amazing.